Are you planning a trip to Istanbul? Look no further. Here you will find a complete itinerary of things to do in Istanbul for a 5-day trip. Istanbul is a truly cosmopolitan city and a bridge between West and East. The hospitality of its people and the beautiful architecture will make you want to pack your life and move here. However, if you only have a few days in this city, let’s make the best out of them! I included some of the most instagrammable places in Istanbul, and all of them are a must-see. Istanbul is divided by the narrow waterway known as the Bosphorus. The city embraces its combination of European and Asian cultures and it is easy to perceive the contrasts. If this is not your first time in the city, you may want to check out non-touristy things to do in Istanbul. Here you will find suggestions for a 5-day itinerary carefully selected so you can see all the must-visit attractions, plus other less known (but equally mind-blowing) locations. Prepare to fall in love with the city of two continents! PRO TIP: You may want to check out the Istanbul Tourist Pass before starting to explore the city. It includes skip-the-line entrances to some of the main attractions, airport transfer, unlimited internet access, dinner cruise in the Bosphorus, boat tour, and even support through whatsapp! Plus a bunch of other bonuses like a Whirling Dervish evening show, hop-on hop-off bus tour, and an Istanbulkart (it’s the card needed here to use public transportation), etc. You can choose between a 3-day and a 7-day pass. I think it is really worth the money and you end up saving tons on entrance fees, transportation, tours, shows and internet! You can get it here. Let’s start by going to the most famous places and main historic sites. Every place mentioned here is in walking distance. Remember these are tourist attractions that may require you to stand in line so it’s better to start at 9 am, the opening hour. Next to the Hippodrome, you will find one of the most photogenic buildings I’ve ever been to. The Blue Mosque acquired its name from the beautiful blue tiles that decorate its interior. It was built in times of Ahmet I, between 1606 and 1616. It is currently an active mosque, so it closes for tourists during prayer times for 90 minutes, and 2 hours on Fridays noon. The exact time varies each month so be sure to plan accordingly. Keep in mind that this is a religious temple, so you will be asked to dress moderately. In any case, they provide scarves, long skirts and plastic bags for your shoes at the entrance (all free of charge). Opening Hours: 9 am – sunset. Opens every day. One of the best things to do in Istanbul. This museum will give you an interesting view of religious history like no other. With a heritage of more than 900 years being a Christian church, and more than 400 years being a mosque, Christian and Islamic symbols share the same roof. Opening Hours: Between October 30th – April 15th: 9 am – 5 pm. Between April 15th – October 30th: 9 am – 7 pm. It is the largest surviving Byzantine cistern in İstanbul. Its main function was to serve as a water reserve to the Great Palace and the surroundings. This underground cistern was constructed using 336 columns. Many of them have typical roman decoration. Walk till the end to see the two Medusa heads. It is still a mystery why one was placed on its side and the other one upside down. The number of little alleys and cute streets at the Old City are countless. There are many restaurants and shops of all kinds. You can walk around ottoman-style houses like the ones in Soğukçeşme Street or the colorful Tavukhane Street. If you want to buy Turkish souvenirs but have a limited budget, you won’t find many budget-friendly shops around here. Although, the beauty and quality are almost always amazing! If you are looking for cheaper options, head to the neighborhoods of Kadiköy or Eminönü (yes, they are included later in this itinerary!). Tip: You may encounter some sellers who approach you in front of the main sites and offer to take a photo of you. Then, they invite you to their store. Don’t feel like you owe them a favor and kindly decline the invitation if that’s what you want. Sometimes, they may say the mosque is closed because it is prayer time, so instead, you can spend time at their store. Again, you are under no obligation of this and it is always better to check the schedule on your own. That’s right, we are not completely done with the Old City yet. You will not want to miss what’s coming. The largest and oldest Palace in Istanbul. It can take around 4 hours to explore this place, but you will love every minute. Going to Topkapi is one of the best things to do in Istanbul on your first visit. Why is it so important? It was the main residence of the Ottoman Sultans and their wives between the 15th and 19th centuries. It will give you a wide understanding of the history of the Ottoman Empire and of the Islamic religion. It’s a must in your 5-day itinerary in Istanbul! The palace has many chambers and rooms that serve now as galleries. You can see collections of many diverse things, but one element is common to all: luxury. And I mean, a lot. The visit to the Harem area is optional but I highly recommend it too. Arrive early to avoid queues. Price: Just the palace: 40 turkish liras. Palace + Harem: 65 turkish liras. Opening Hours: Between October 30th – April 15th: 9am – 4:45pm. Between April 15th – October 30th: 9am – 6:45pm. Take the tram to Kabataş Station. From there, you can either take a taxi or a bus to Ortaköy. Even though this place is not mentioned in many Istanbul guides, I promise you, it’s very special! Take a moment to embrace the beautiful view of the Bosphorus and then enter the Ortaköy Mosque. The official name is Büyük Mecidiye Camii, and you will probably fall in love with its huge chandeliers and pastel colors. While you are outside, try the traditional kumpır or maybe a waffle, if you are in for a treat! Go back to the Old City and visit one of its main attractions: The Grand Bazaar. This marketplace is one of the oldest and biggest in the world. You will find more than 3000 shops offering a wide variety of beautiful products. Believe me, you will want to save some budget for this place. Tip: Remember to bargain! Especially if you are taking several things from a store, you can always agree on a better price. Say something like “yabanci değilim” (I’m not a foreigner), or “turk fiyat, lütfen” (Turkish price, please). Sellers will probably appreciate the effort (or secretly make fun of you) and save you a few liras! Get ready for another day of visiting historical gems. Except that this time you will also see a more modern and hipster side of Istanbul. The last six Sultans resided here after centuries of living at the Topkapı Palace. The Dolmabahçe Palace became the administrative center of the late Ottoman Empire. Once you are inside, you will be guided in English or Turkish (you choose) throughout the rooms and halls. Taksim Square is considered the heart of Modern Istanbul and it lives up to it. You will find a huge number of restaurants, bars, and even churches and mosques in its surroundings. It’s a place also for political meetings and/or protests. Continue your way through Istiklal Avenue, an interesting pedestrian street. It is always crowded by many people from all over the world. The street is full of stores and restaurants. At night, a lot of parties take place here. Whatever your preference is, a small pub or a glamorous club, you can find it. 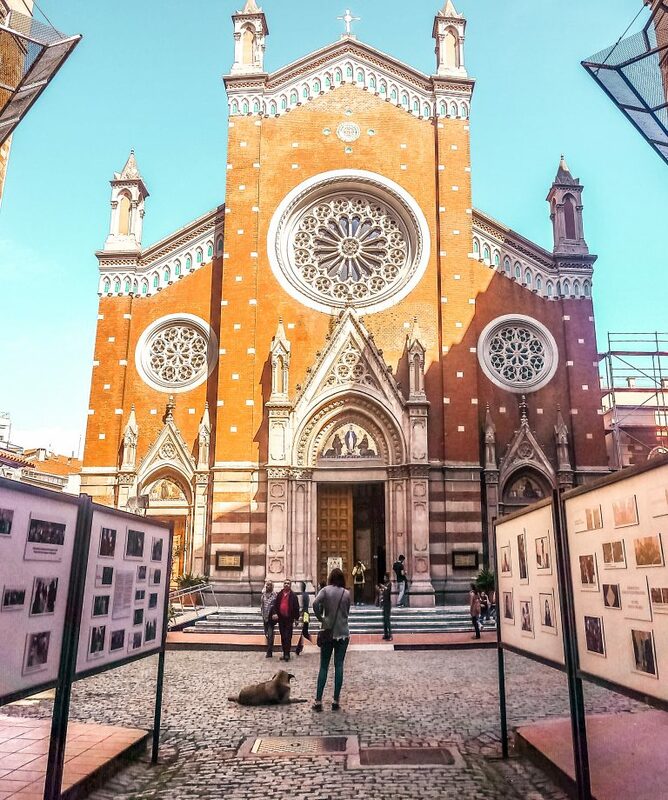 Check out some points of interest like the Çiçek Pasajı or the Church of St. Anthony of Padua. 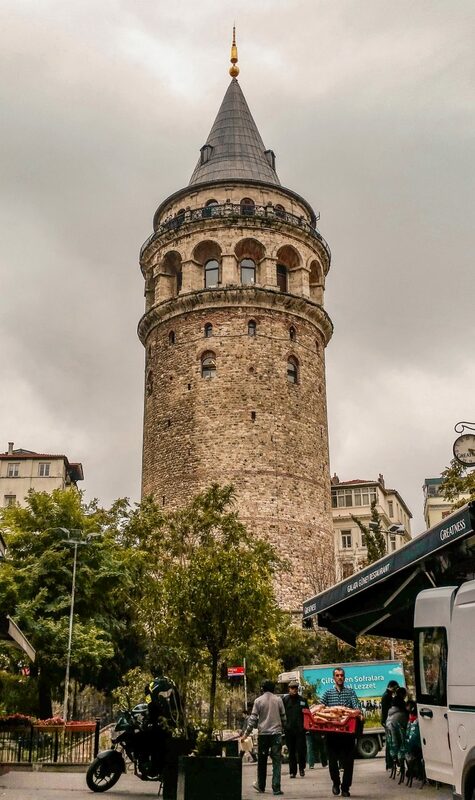 The Galata Tower has origins from back to the year AD 507 when it was built as a wooden tower. It was later expanded and used for different purposes, such as an observatory for fires in the city. From outside, it gives a special touch to Istanbul’s skyline. You can also climb up the tower to have an amazing 360º view! Don’t worry, a lift takes you through 7 floors, and you only have to walk up 2 more floors. There are a restaurant and a cafe at the top, but you don’t necessarily have to enter those. Opening Hours: 9 am – 8 pm. Opens every day. Since you are close, why not explore the hippest neighborhood in Istanbul? Head to the ferry dock on the eastern side of the Galata Bridge and then walk around the corner to the left. If you want to try baklava the right way, here is one of the most famous places for that: Karaköy Güllüoğlu. If you feel like eating something more substantial or having some drinks, there are plenty of restaurants and bars if you continue to the left. Walk through the hipster vibes of these narrow streets with lots of street art. Today is all about Byzantine memories and mingling with the locals. Eminönü’s district will give you a more local feel but it’s still plenty of touristic sights. Get lost in the chaos of the streets and broaden your understanding of Turkish customs. The Chora Church or Kariye Museum displays jaw-dropping mosaics and frescoes of Byzantine art. Most of the mosaics depict the lives of Jesus and Virgin Mary according to the Orthodox tradition. After the conquest of Constantinople, ottomans converted the church into a mosque and ordered the covering of these images. Ironically, this action helped the preservation of the art that we can enjoy now. Opening Hours: 9 am – 4:30 pm. Closed on Wednesdays. After visiting Chora Church, walk to Fevzi Paşa Street and take a taxi or a bus (leaves you a few blocks away) to Süleymaniye Mosque. You will love this ottoman imperial mosque. Built by Mimar Sinan (the greatest Ottoman architect) exhibits a stunning combination of Islamic and Byzantine architecture styles. It resembles the Blue Mosque, but the interior is a bit soberer and the crowds are non-existent. Definitely worth a visit! Opening Hours: 9 am – 5:30 pm. Closed during prayer times. Opens every day. Walk down heading to the sea. You will pass numerous alleys and stores from the Eminönü market. There are many souvenirs at a cheaper price than at the Grand Bazaar. If you continue walking, you will arrive at the port. Take in the beautiful view of the Bosphorus, the bridges, and the colorful “balık ekmek” boats. Cross the Galata Bridge and watch the sun go down while the fishermen catch the last fish of the day. Don’t miss on trying a fish sandwich at one of the restaurants below the bridge while enjoying the view. A lot of tourists skip visiting the Asian side but I honestly think no Istanbul itinerary is complete without visiting here. Istanbul is one half in Europe and one half in Asia, so it’s only logical to see what both continents offer. The Asian side will give you spectacular views and another glimpse into the modern local life. Take a ferry to Üsküdar station. It is faster than crossing the bridge by car and you will love watching the seagulls flying around the ferry. Once in Üsküdar, walk to your right a few blocks and you will see the Maiden’s Tower in a small islet in the Bosphorus. Take a seat in front of the tower and enjoy one of the most iconic images of Istanbul, with a cup of tea and a simit. You can also take a small motorboat that will take you to the tower. Kadiköy is a very diverse district, with lots of pubs, vintage shops, and fish restaurants. If you walk near the seaside, you will be able to have a great view of big ferries and lots of seagulls being fed by the locals. Get lost in the neighborhood and enjoy the street art scene created by local and foreigner artists. Or you can have tea and börek in one of the many tea gardens of Moda. And talking about Moda’s tea gardens, they have an incredible view of the Marmara Sea, the Fenerbahçe lighthouse on one side and Prince Islands on the other. One of the things to do in Istanbul by locals on a normal day is to walk down the waterside walk. It is a wide pedestrian path from Kadiköy to Bostancı. On the way, you will see swimmers, runners, rollerbladers, couples, etc. Plus, you’ll get a beautiful view of the sea where many yacht-owners leave their sailboats. At night, head to Kadife Street, mostly known as “Bars Street”, where most of Kadiköy’s lively bars and pubs are located. One of the recommended things to do in Istanbul is to experience at least one Turkish bohemian night. Finally on our itinerary of things to do in Istanbul, is Bağdat Avenue. This avenue is so famous that is commonly called “the street” (Cadde). It is 9 km for shopping from exclusive brands, dining from local and international cuisine restaurants and cafes, and socializing. Just so you have an idea, a research made by a French market-consulting company established Bağdat Street as the 4th best shopping street in the world! That’s a position way before the 5th Avenue in New York. Tell me, what are your favorite things to do in Istanbul? Merhaba!! We lived in Turkey over 20 years ago and I love this country! Please tell me you experienced the Turkish bath house! It was one of the top 10 things I have ever done. That plan is perfect! I am going to Istanbul in November for 5 days and would probably use your itinerary. Most of the things I want to see and do are already there. Thank you so much for this great post!